3:29 a.m. — Police talked to three people at Powers Reservoir who were at the reservoir when it was closed. They were reminded of hours at Powers. 10: a.m. — Police officers stood by during a utility shut off in the 100 block of Dawsett Avenue. 10:30 a.m. — A business in the 300 block of Railroad Street wanted a report made about an employee who reportedly stole a company vehicle on July 11. 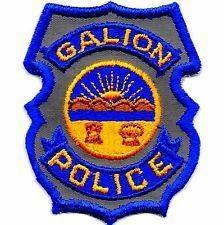 11:56 a.m. — Police responded to Galion Hospital in reference to a person who did not want to leave the hospital. 2:47 p.m. — An employee of Firelands Federal Credit Union called police to report someone was in the bank drive-thru trying to cash a stolen check. 6:09 p.m. — Police responded to the 400 block of Sherman Street to talk to someone who was receiving a lot of phone calls and texts and emails. 8:42 p.m. — Police and EMS responded to a report of an elderly woman who fell on Airport Road and was injured. 9:31 p.m. — Officers were sent to the 200 block of East Payne Street after receiving a call about a confrontation. 10:24 p.m. — After a traffic stop, police arrested a woman on a warrant from Morrow County. 11:07 p.m. — After a reported civil dispute in the 100 block of South Street, officers cited a man and gave him a court date. 12:10 a.m. — A caller reported three kids “messing around near the front door” of the YMCA. Police took information to file a report. 8:56 a.m. — A report of stolen cigarettes was received from Rich Oil on South Market Street. The caller said the thief was captured on video. 9:39 a.m. —. — Police received a report of a man taking pictures at a construction site and instruction a worker there how to do the job the right way. The man left before officers arrived. 10:37 a.m. — A resident in the 300 block of West Atwood Street reported some window blocks had been broken. 1:54 p.m. — A man in the 100 block of Hessenauer drive was accused of stealing utilities. 4:28 p.m. — Police responded to the 500 block of North Market Street in reference to someone allegedly breaking the rules of a protection order. 5:20 p.m. — Police responded to the 400 block of South Boston Street in reference to a person who kept hearing rumors that a relative was dead. It was determined that a rumor had gotten out of hand. 7:27 p.m. — A resident in the 100 block of Harding Way East because he said three teens had entered his residence via the roof. 10:52 p.m. — A storage unit State Route 309 mini storage had apparently been broken into. 10:57 p.m. — Police responded to a report of a man on Orange Street who was threatening to kill. Information was taken for a report. 12:45 a.m. — Police responded to a call from Circle-K on East Street about some people throwing trash in the parking lot. Police talked to the trash dumpers and made them go back and pick up the trash they had dumped. 1:22 a.m. — One teen was given a warning for a curfew violation after police received a call from the American Legion on South Market Street about kids messing around behind their building. 3:26 a.m. — A man was arrested in the Wilson Avenue area for domestic violence after police responded to a 911 call. 2:05 p.m. — Police received a complaint of about 50 people in the 300 block of Harding Way East who were become a nuisance. Police determined those in the group were playing Pokemon. 5:11 p.m. — After getting a call about a fight about to happen at Cobey Park, police issued citations to two people for possession of drugs; At 9:53 p.m., police received another call about a fight supposed to be imminent at Peco Park. There was no fight; At 11:22 p.m., police received a report of a big fight in the 300 block of East Payne. One person was arrested for obstructing justice and for disorderly conduct. 9:42 a.m. — Officers assisted Life Support in the 300 block of W Southern Ave. regarding someone that had fallen from a ladder. 9:53 a.m. — A Woodlawn Ave property owner reported vandalism to his property by a tenant. 10:42 a.m. — Officers assisted Galion PD in the 1800 block of E Mansfield St. checking for a reported stolen vehicle. 11:16 a.m. — A subject came on station to speak with an officer regarding the theft of money. 1:43 p.m. — A Marion Rd resident reported two rings taken from her home sometime since June. 2:27 p.m. — Officers made a welfare check on Cleland Ave.
2:49 p.m. — A theft report was taken in the 400 block of W. Warren St.
3:06 p.m. — Officers responded to complaint of a reckless driver north on St. Route 4 entering Bucyrus and the vehicle was stopped near the 800 block of S. Sandusky Ave. A 45-year-old woman was arrested for operating a vehicle under the influence of alcohol. 5:41 p.m. — A report of a solicitor without a permit was made in the 500 block of S. East St. and the subjects were contacted with info on how to apply for permits. 6:22 p.m. — A theft report was taken in the 100 block of E. Lucas St.
7:09 p.m. — A report of a suspicious powder found on N. Lane St. was unfounded. 7:20 p.m. — A report of harassing text messages was made at the Police Department. 8:43 p.m. — A disturbance in the 200 block of E. Mary St. was a verbal dispute between parties. 8:52 p.m. — A trespassing and larceny was reported in the 800 block of S. Poplar St.
9:08 p.m. — A 911 hang up call was a verbal domestic issue in the 1400 block of Woodlawn Av. 10:06 p.m. — Officers conducted a welfare check in the 1400 block of Woodlawn Ave.
10:11 p.m. — Officers responded to a disturbance in the 600 block of S. Sandusky Ave.
10:50 p.m. — Officers assisted EMS at Bucyrus Blades. 11:07 p.m. — Officers picked up an abandoned bicycle in the 100 block of S. Spring St.
12:43 a.m. — Officers assisted EMS at Bucyrus Plaza. 1:15 a.m. — Officers warned a juvenile about curfew violation in the 500 block of S. Sandusky Ave.
6:58 a.m. — A Sears St resident reported her home broken into. A ring was reported missing. 10:58 a.m. — A S Poplar St resident was warned reference his dog continually barking. 12:21 p.m. — Officers spoke with a Martin Ave resident regarding an accident he was involved in approximately two weeks ago. 12:26 p.m. — Officers took a vandal report in the 200 block of Woodlawn Ave.
2:56 p.m. — A subject came on station to report being threatened. 3:35 p.m. — A domestic dispute was investigated in the 200 block of Whetstone St.
3:50 p.m. — Two vehicle accident in the 900 block of Maple St.
4:11 p.m. — A report of property damage was taken in the area of Penn Av. 4:19 p.m. — A domestic report was taken at the Police Department. 4:28 p.m. — A welfare check was requested in the 100 block of N. Sandusky Av. 5:35 p.m. — Officers picked up property in the 400 block of Myers that is believed to be stolen. 5:43 p.m. — A verbal traffic warning was issued to two bicyclist in the 300 block of S. Walnut St.
6:00 p.m. — A possible drunk driver was reported in the area of Whetstone St.
6:34 p.m. — A disturbance was reported in the Pinewood Ct. area. 6:34 p.m. — A theft report was taken in the 500 block of S. Sandusky Av. 6:49 p.m. — A trespassing complaint was taken in the 400 block of E. Oakwood Av. 6:52 p.m. — Subjects soliciting without a permit were warned in the 1100 block of Fremont St.
6:55 p.m. — A domestic dispute was reported in the 300 block of W. Liberty St.
7:07 p.m. — Possible child abuse was reported. 8:23 p.m. — A 911 hang up call was investigated in the area of Failor and Wheeler St.
9:35 p.m. — A W. Mansfield St. resident reported a laptop stolen. 11:37 p.m. — A report of noises heard outside the Inn at Orchard Park was investigated. 12:35 a.m. — Officers responded to an alarm in the 100 block of N. Lane St.
2:26 a.m. — A 23-year-old was arrested on 2 warrants from the Mansfield post of the Ohio Highway Patrol.